My second year of working with Creative Partnerships was completely different. This time I was working in Prince of Wales, a larger school with two form entry. What I wanted to achieve this year was correct as much as possible some of the things that I felt needed improving from the previous years’s project. Most importantly I had felt that with some groups in Coppermill School the amount of input that the children had in creating their films had been limited. This was partly because we had been so ambitious and only had so much time. One thing that was very different was that each year group wanted to be in front of the camera – which meant that most likely we wouldn’t be able to distribute the films online. Again I worked on a range of film projects with different year groups and teachers. These included documenting bean growing, a film that morphed each child’s face into the next child, short dramas about bullying, cooking shows and a time-lapse film of chicks growing. I got a text message from one of the teachers saying the chicks are hatching and had to rush to the school and set up a camera. Again the project culminated with a film showing afternoon in which the year 5’s excelled in keeping the popcorn flowing and we had a surprise guest when a field mouse dropped down from the ceiling right in front of the screen and set people rushing from the room. The work this time was much more in response to projects that the year groups had been working on that year. 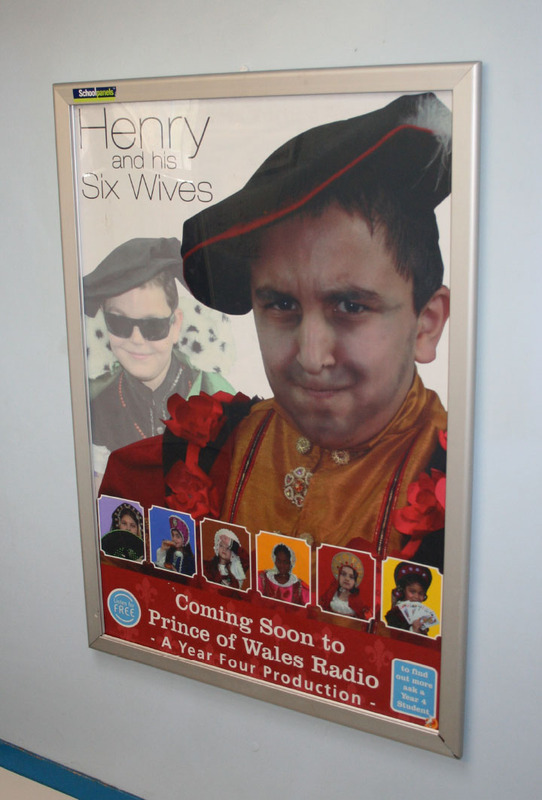 This included year 4s Henry VII project. They wanted to make a radio show with an episode focussing on each wife. To help promote the radio program I set up a photo shoot with class members dressed up as each of the wives plus a young Henry and old Henry. These posters were printed as giant posters and placed in the school lunch hall.